Often the daily demands of caring for a loved one with dementia can be overwhelming. Hudson Creek Alzheimer's Special Care Center would like to help lighten the load by offering you and your loved one short-term assisted living and respite care in Bryan, TX. 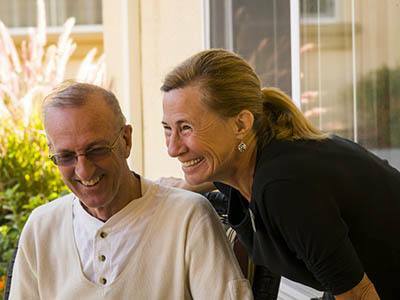 Our affordable respite care options and inviting outdoor and indoor areas, paired with our friendly residents, will help your family member feel immediately at home. Our warm and professional staff members live on site in order to help residents with any needs, 24 hours a day. Seniors enjoying our respite care will have access to all of the entertainment, lifestyle options and meals our current community members enjoy. In addition to short-term assisted living, Hudson Creek Alzheimer's Special Care Center also offers rehabilitative respite for those seniors who are recovering from a hospital stay or injury and are not yet ready to return to their home. Contact us today to find out more about the senior respite care options at Hudson Creek Alzheimer's Special Care Center!